I can't give you the St. Maarten weather report , but I can give you the California weather.. Currently it is sunny and cold with rain expected tonight.. When I say cold, I mean 60 degrees. That's cold for me. We've been traveling in French Polynesia. Check my blog for some photos and trip details. French Polynesia is beautiful but it made me realize how beautiful our part of the world is too. It's been a very nice trip but I am ready to head home for St. Maarten. The weather is beautiful on St. Maarten. The day started out with a beautiful sunrise. 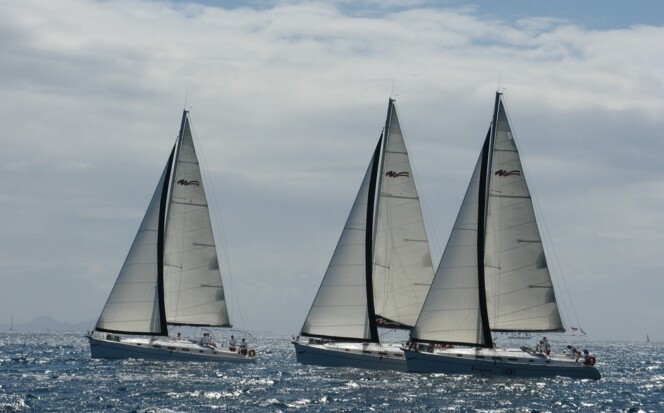 The Heineken Regatta is this weekeknd. I went out on a spectator boat this morning and took a few pictues. 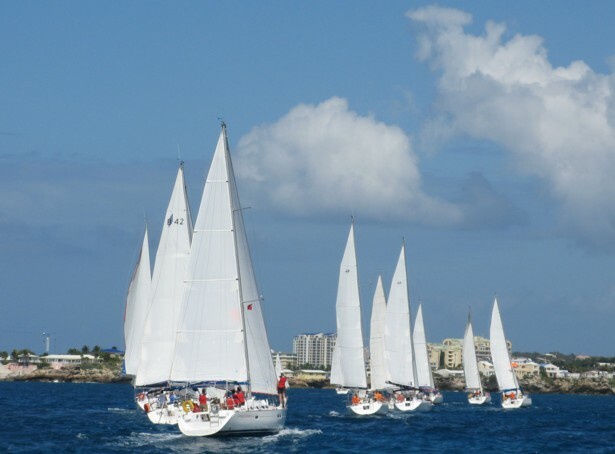 They have excllent sailing condiitons this year. 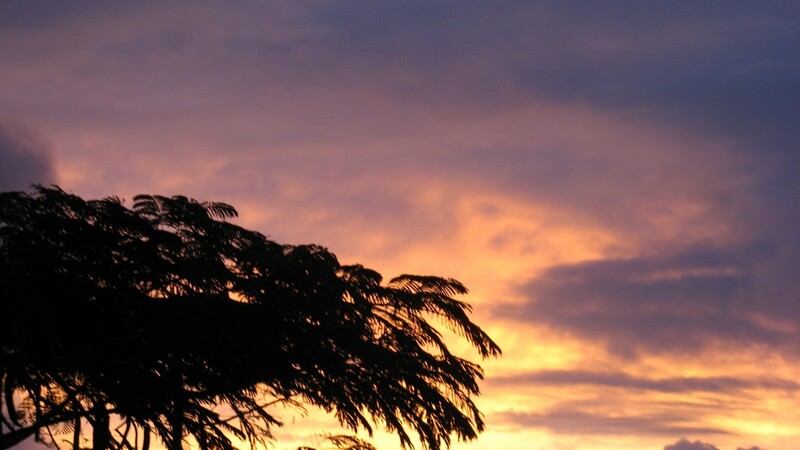 It was a lovely sunrise this morning. Good morning from St. Maarten. The day is dawning with a lot of clouds but the sun was trying to peek through. I don't think we will see much sun today though because as I sit here the cloud cover is rolling in heavier. Things still look stormy to our south. It was quite a night. We had a heavy thunder and lightening storm last night. Of course, that caused the satellite reception to go out. All those watching the NY Giants - Green Bay Packers football game were NOT happy! Fortunately the storm passed, the game came back on, and all was well. People were able to watch the Giants win , to go on to the Super Bowl. It stormed on and off all night, I think. I was awakened a few times during the night by the sound of thunder. This morning my little back yard rain gauge tells me we received 1.5 inches of rain. Heavy rain shower here a few minutes ago. Skies are still cloudy and the wind is up. 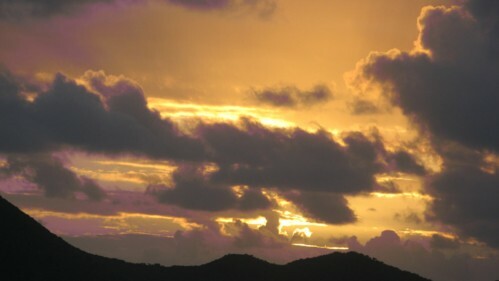 When I look at the Satellite picture, I see this over St. Maarten. It doesn't look like much but it is sure producing some squally weather. I can tell you that around my house it definitely is gusting to at least 30 MPH. It's 10:30 in the morning and the thermometer says 78 degrees and I am cold. I guess I shouldn't complain when NYC is 33 degrees right now. I'm not worried though. I am sure that within no time at all the sun will peek out and start warming things up. It's nice weather for the most part... blue skies,white clouds, and no wind.... it is so calm, the sea looks like a glass lake. But then a rain cloud comes. And it sits over our house and brings rain. It seems to directly target us. Am I paranoid? I can see across the pond and town gets no rain..just our area, and we got 2 cm of rain this afternoon..
We also got a rainbow. 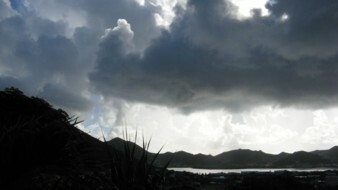 St. Maarten started out the last day of the year with clouds and rain. The rain has stopped but it is still rather cloudy. I hope we don't have a rainy night tonight. A big party is planned in Philipsburg on the boardwalk with fireworks and Kassav playing. Hope they don't get rained out. Have a safe happy night tonight everyone and bets wishes for 20008. Does my previous message read like I am only wishing hurricane correspondents in St. Maarten Happy Holidays? I think the holiday rush is getting to me. 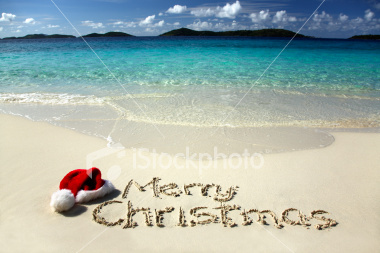 To all the hurricane correspondents and their friends and families , Merry Christmas from St. Maarten. We wish you happy holidays and we look forward to a healthy, happy, hurricane free 2008 for all! Merry Christmas to all the hurricane correspondents and their friends and families from St. Maarten. We wish you happy holidays and we look forward to a healthy, happy ,hurricane free 2008 for all! We've had lots of rain showers last night and this morning. 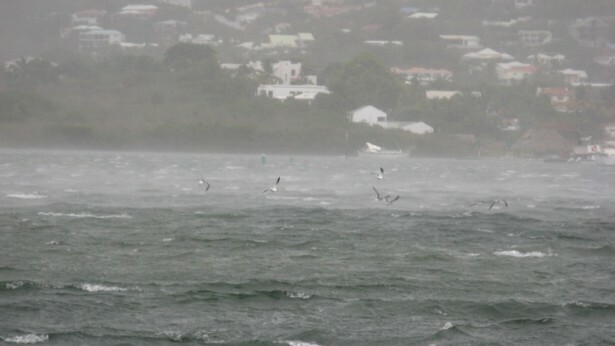 It's quite windy so the squalls come in hard and fast and last maybe a minute. I checked my rain gauge and we did manage to accumulate about 1.5 inches. That's a good thing since our water company seems to be having serious shortages. Those on the island who do not have cisterns to rely on have been experiencing water outages. And the showers are keeping the island nice and green also. It appears we all have been wishing Sabans Happy Saba Day a wee bit too early. Saba Day is always celebrated on the first Friday of December..that is next weekend. It will be celebrated December 7-9 this year. So we jumped the gun a little bit. Did anyone else find it interetsing that the entire Caribbean experienced an earthquake just as we were getting ready to celebrate the end of hurricen seaason? I gues it is Mother Nature's way of saying to us that we shouldn't get too complacent. Happy Saba Day to all you guys over there on the "Queen." GREAT BAY, St. Maarten (GIS) – The Chairman of the Emergency Operations Center (EOC) Governor Franklyn E. Richards reported late Thursday afternoon that there were no damages due to the 7.3 magnitude earthquake that was experienced on Thursday afternoon around 3.00pm. The earthquake occurred off the East coast of Martinique at a depth of 121 km, according to the Seismic Research Unit. This is the strongest earthquake event reported since 1974. Emergency Support Functions (ESFs) Fire Department (ESF-4) and the Department of Public Works (ESF-3) did a damage assessment survey of the island after preliminary reports came in of possible damage associated with the earthquake. The ESFs reported to the Office of Disaster Management & Preparedness that there were no damages. Reports have indicated that the earthquake was widely felt across the Eastern Caribbean as far north as the British Virgin Islands and as far South as Guyana. “The earthquake felt on Thursday afternoon was indeed a very strong one that was felt across the nation. I am pleased that there were no reports of injury or damage. “I would like to thank the Governor of Curacao Lisa Richards-Dindial who called to find out if we had sustained any damages and to offer whatever assistance would be required. I thanked her for her consideration and solidarity with the people of St. Maarten. “I would like to offer my prayers and thoughts on behalf of the government and people of St. Maarten to the island/s that were seriously impacted by the earthquake and wish them all the best with their recovery efforts,” Governor Richards told the Government Information Service (GIS) on Thursday. Governor Richards also spoke with the Governor-General of the Netherlands Antilles Frits Goedgedrag and provided him with an update. Governor Goedgedrag was also expected to inform the Prime Minister. - Did you feel it? Around 3:00 PM, thing started rumbling here. I thought it was someone's boom box with very hard and loud bass. But, no, it was an earthquake. It rumbled and rumbled and everything shook and it seemed to go on and on. People ran out of some buildings they were so scared. I do not believe we had any real serious damage though. The earthquake, a strong one, 7.4, was centered just North of Martinique. I hope the people in Martinique (and also Dominica) are OK and have not suffered too much damage. Please, any correspondents from there, let us know how you are doing. Here is the link to the USGS web site, listing the latest earthquakes around the world. THis one is at the top of the list! reports of minor damage here and there. Apparently the quake measured 7.3 and was between Dominica and Martinique. Otherwise, everything is fine on the Friendly Island. Happy Thanksgiving to all those who celebrate it and those who don't. It's not just a time for pigging out, but a time to give thanks too. We can all give thanks for an uneventful hurricane season this year. I always feel strange on Thanksgiving Day on St. Maarten. It's not a holiday here, of course, but many of us celebrate it with fond memories of growing up in the States and going to grandmother's house to be with family and have a delicious dinner. So, holiday or not, I am in holiday mode, and it looks like the start to a beautiful day. It's been raining all night. The sound of the rain on the roof was very soothing actually. The ground is saturated though.. We cannot take much more heavy rain. This morning is cloudy and overcast and drizzling, and it is windy. I am cold.. I need some sun, but don't think I will get any today. . This system is moving very slowly. And as I type, the skies have just darkened even more and more rain is coming. I have to go turn on the lights in the house because it is so dark. PORTIONS OF THE VIRGIN ISLANDS...PUERTO RICO...AND HISPANIOLA. Heavy rain here right now. It's a white out. This will definitely cause flooding if it continues for long. Why does it always happen at rush hour when people are trying to close their stores and get home? Traffic will be a real mess. 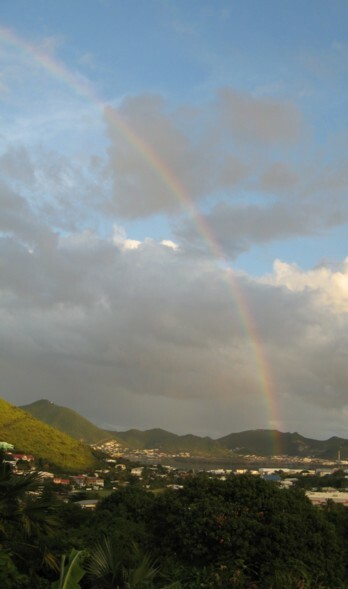 We have had a pleasant weekend on St. Maarten with mostly sunny skies and only occasional rain showers. We had a brief rain shower this morning and the sky to the East looks threatening, although it may just blow past us. 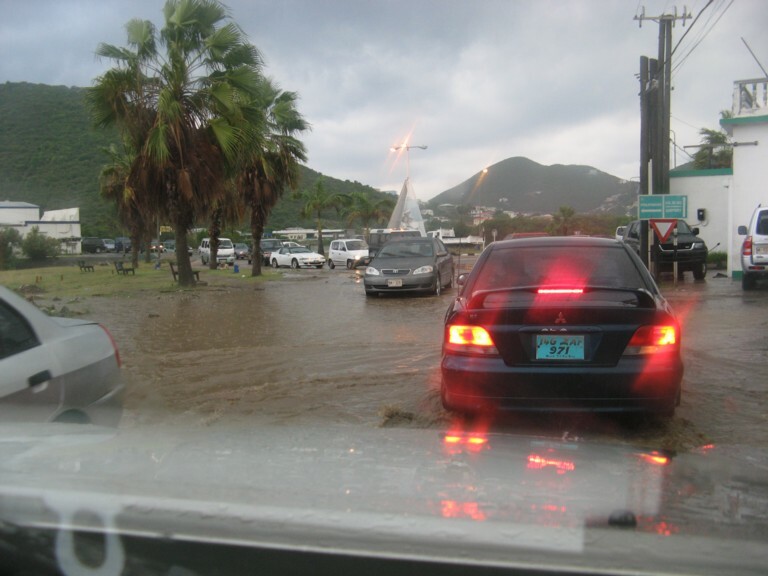 GREAT BAY, St. Maarten (GIS) – Governor Franklyn Richards who is also Chairman of the Emergency Operations Center (EOC), says the 2007 hurricane season has been mild so far, but not yet over and persons should remain in a state of preparedness despite this. Forecasters from the Colorado State University Phil Klotzbach and William Gray recently released their updated hurricane forecast for October and November and in their opinion they expect it to be very active. Klotzbach and Gray have forecasted four named storms for the next two months, two of those predicted to reach hurricane strength and one of those is expected to become a major hurricane with wind speeds of over 111 miles per hour. 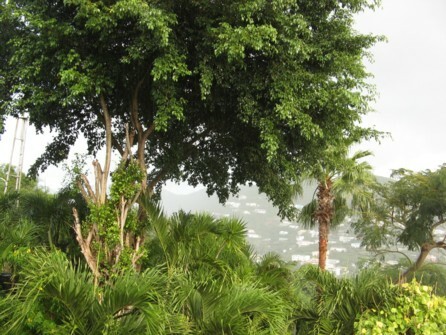 St. Maarten has in the past experienced late bloom hurricanes such as Tropical Storm Jose around October 21, 1999 and Hurricane Lenny better known as “left-handed Lenny” that arrived from an unexpected direction, the West, around November 18, 1999. Tropical Storm Klaus in 1984 passed by November 6, 1984. “The season has already seen several catastrophic hurricanes namely Dean and Felix. It is in our interests to maintain a certain state of preparedness as we continue to go through the season. Continue to monitor weather reports in order to keep informed of possible storm activity which would allow you and your family to take the appropriate measures,” Governor Richards told the Government Information Service (GIS) on Sunday. The remainder of names for the 2007 Hurricane Season is: Noel, Olga, Pablo, Rebekah, Sebastien, Tanya, Van and Wendy. Andrea formed in May as a subtropical storm followed by Barry in June, Chantal in July, Dean, Erin in August and Felix, Gabriella, Humberto, Ingrid, Jerry, Karen, Lorenzo, Melissa in September. The hurricane season runs through November 30.
in their opinion they expect it to be very active. to become a major hurricane with wind speeds of over 111 miles per hour. November 18, 1999. Tropical Storm Klaus in 1984 passed by November 6, 1984. Government Information Service (GIS) on Sunday. prepared yourself for the hurricane season?? Rebekah, Sebastien, Tanya, Van and Wendy. Karen, Lorenzo, Melissa in September. All day it has been raining lightly and thundering. We just had a very heavy thunderstorm and downpour. My rain gauge is measuring 2.5 inches of rain that just fell. The "blob" is sitting right over us and does not seem to be moving. There is absolutely no wind to push this "blob" away from us. The day started out partly sunny but now the clouds have rolled in and it has been raining on and off all afternoon. We had quite a lot of thunder and little rain at first. Then it started with a more steady drizzle and for the past hour we have been getting a lot of heavy rain. Here is approximately the same view as above, taken just now. That little blob to the East of us is giving us some much needed rain. There is hardly any wind though, so I think it will be moving very slowly out of the area. I would imagine the commute home for people tonight will be a long one. Our roads begin to flood with one drop of rain. It was a rainy morning early this morning and we had a few good showers over night too. My rain gauge says we received 2 inches of rain. I took this picture as it was still raining over one part the hills but the sun was trying to break out throguh the clouds. 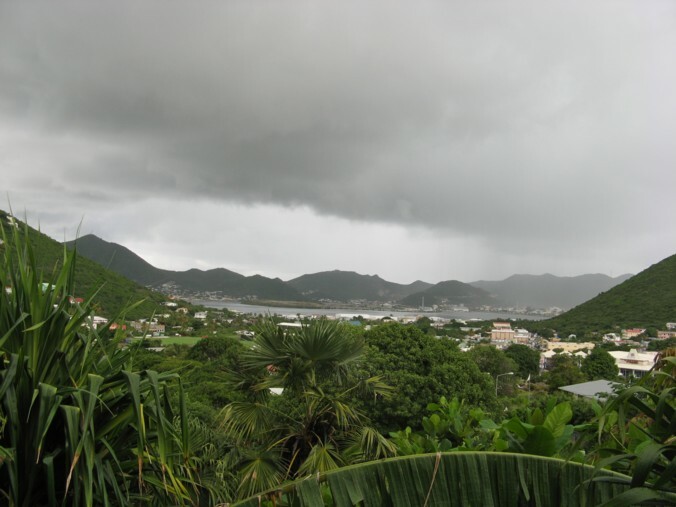 GREAT BAY, St. Maarten (GIS) – Residents are being advised to closely monitor weather reports in the coming days as well as the coming weeks as storm formation activity has increased somewhat and we are still in the peak part of the 2007 hurricane season, Office of Disaster Management & Preparedness said on Wednesday. At the moment Tropical Storm Karen is located over 1000 miles East of the Caribbean island chain. Forecasters are predicting that it could develop into a Hurricane. It does not pose a direct threat to the islands; however residents should monitor the storms progress until it clears the island chain. There is also another un-named system behind Tropical Storm Karen which is worth monitoring. Now is also a good time to review your hurricane preparations such as your Family Disaster Plan and Disaster Supply Kit. The Family Plan should be based on your vulnerability to Hurricane Hazards that could affect your family such as storm surge or flooding. By knowing your vulnerability and what actions you should take, you can reduce the effects of a hurricane disaster. Every home should have a Disaster Supply Kit which would contain certain items you need to have regardless of where you ride out a hurricane. Forecasters from the Colorado State University Phil Klotzbach and William Gray forecasted for the month of September to expect five named storms and another five in October/November. They predicted four of the five storms in September to become hurricanes, with two of them reaching major hurricane status, with winds greater than 111 miles per hour. For October/November, forecasters expect two of the five named storms to grow into hurricanes. They forecast one of those two will become a major hurricane. Mid September was the peak of the season and up until mid-October are considered active weeks. Hurricane forecasters have predicted 15 named storms for the season, eight are expected to develop into hurricanes, and four are forecast to reach intense hurricane strength, with winds of 111 miles per hour or more. The remainder of names for the 2007 Hurricane Season is: Lorenzo, Melissa, Noel, Olga, Pablo, Rebekah, Sebastien, Tanya, Van and Wendy. Andrea formed in May as a subtropical storm followed by Barry in June, Chantal in July, Dean, Erin in August and Felix, Gabriella, Humberto, Ingrid, Jerry and Karen in September. residents should monitor the storms progress until it clears the island chain. should take, you can reduce the effects of a hurricane disaster. you need to have regardless of where you ride out a hurricane. winds greater than 111 miles per hour. into hurricanes. They forecast one of those two will become a major hurricane. hurricane strength, with winds of 111 miles per hour or more. Noel, Olga, Pablo, Rebekah, Sebastien, Tanya, Van and Wendy. It seems as though the remnants of Ingrid are still hanging over us. It was a nice day but in the afternoon dark clouds started rolling in from the North and thunder could be heard in the distance. About 5 PM, the heavens opened up. Unfortunately the roads immediately flooded and my husband and I were stuck in traffic. When I finally did get home, I checked my rain gauge and it had rained 1.5 inches in a little under an hour. Right now it is still lightning and thundering but the rain has stopped. Well, we finally got some rain from the remnants of Ingrid. Last night we hearsd heavy thunder for over 2 hours before we saw rain. Then we got a nice downpour that gave us 1 inch of rain, according to my back yard rain gauge. There was a strong thunder and lightning show also. I was praying that the lightning wouldn't strike my cable TV transformer outside on the pole. We had just waited a week for them to come fix it, and they did it earlier in the day, saying it had been damaged by lightning...and then that night, we have a thunderstorm with lightning? Oh oh, my bad luck! You know I had my fingers and toes crossed. But all is well. Cable TV works fine this morning. 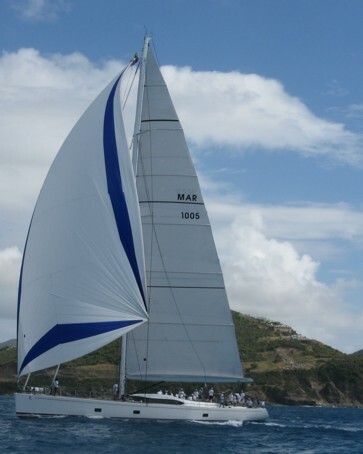 260 MILES...415 KM...EAST OF THE LEEWARD ISLANDS. TOWARD...WEST NEAR 12 MPH. MAXIMUM SUSTAINED WINDS...35 MPH. Like some of our neighboiors, we have had no rain from the "blob." Even though it looked like it was right on us. At sunset today, the clouds broke, and the sun came through. Everything was a golden yellow. 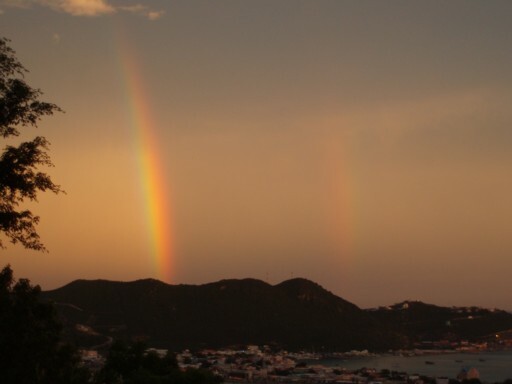 My friend sent me a picture she took of a double rainbow. GREAT BAY, St. Maarten (GIS) – Governor Franklyn Richards, says forecasters from the Colorado State University Phil Klotzbach and William Gray recently released in their updated hurricane forecast to expect the remainder of the hurricane season to be active. For the month of September they expect five named storms and another five in October/November. They predict four of the five storms in September to become hurricanes, with two of them reaching major hurricane status, with winds greater than 111 miles per hour. “I call on the nation to bear the aforementioned in mind and to continue to be prepared to take action when required. The season has already seen two catastrophic hurricanes namely Dean and Felix. It is in our interests to maintain a certain state of preparedness as we continue to go through the season. Continue to monitor weather reports in order to keep informed,” Governor Richards told the Government Information Service (GIS) on Monday. For October/November, they expect two of the five named storms to grow into hurricanes. They forecast one of those two will become a major hurricane and think one of those two will become a major hurricane. Mid September is the peak of the season and the coming five weeks until mid-October are considered active weeks. The remainder of names for the 2007 Hurricane Season is: Humberto, Ingrid, Jerry, Karen, Lorenzo, Melissa, Noel, Olga, Pablo, Rebekah, Sebastien, Tanya, Van and Wendy. Andrea formed in May as a subtropical storm followed by Barry in June, Chantal in July, Dean, Erin in August and Felix, Gabriella in September. hurricane season to be active. greater than 111 miles per hour. season. Continue to monitor weather reports in order to keep informed,? Governor Richards told the Government Information Service (GIS) on Monday. in July, Dean, Erin in August and Felix, Gabriella in September. There's a little "blob" just East of us. It is showing more convection this morning. The models seem to show it going slightly North of PR.. It bears watching I think. My husband just reminded me that today is the 12th anniversary of Hurricane Luis hitting St. Maarten. Luis was a strong CAT 4. He says he will never forget. I was not on the island when Luis hit but I got back 4 days after. I will never forget the horrible aftermath, the cleaning up, the rebuilding...it seemed to take forever.... 3 months without electricity....6 months without a phone.. and we were the lucky ones..our home was still standing. The aftermath of a hurricane is almost as bad as living through the actual storm itself. I think of that now as I think of people recovering from the effects of Hurricanes Daniel and Felix. I sent out well wishes for Aruba Curacao and Bonaire and thankfully they were spared. Now I will send out more well wishes for those in Honduras, the Bay Islands, Belize,etc. Felix is a monster hurricane and it is scary. Everyone please prepare well. Don't take any chances with this cane. A difference of only a few miles can be the difference between minor problems and total destruction. We are all thinking of all of you. GREAT BAY, St. Maarten (GIS) – Coastal residents are being advised by the Office of Disaster Management & Preparedness (ODMP) to be prepared to take timely action in the event a hurricane was to threaten the island. 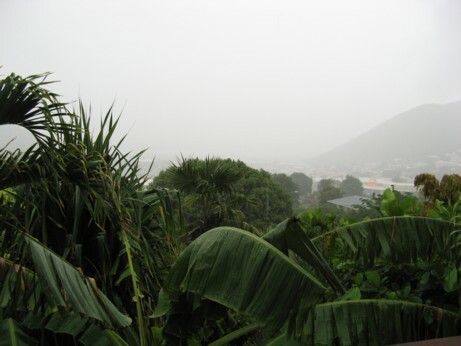 The Southerly coastlines of the island are dotted with homes and are in danger from storm surge in the event of a hurricane passing the island. A hurricane system can devastate coastal communities taking lives and destroying property. After hurricane Lenny in 1999, coastal communities suffered tremendous damaged, but have been rebuilt. These properties remain at a high risk for storm surge and flooding. Residents living along the coast are hereby advised to have a plan in place that would allow them to relocate prior to a hurricane strike. This plan should also include what they would do with their pets. Hurricane Dean tracked along the Southern coast of Jamaica causing severe damage to residential communities two weeks ago. Whether the hurricane season is predicted to be active or not, members of the public should be prepared and monitor weather reports in order to keep abreast if a system has developed and what threat it could pose to the island. It only takes one storm system to create havoc. For new residents who haven’t experienced an active hurricane season or a hurricane itself, do not be unconcerned because it only takes one hurricane in the season to ruin lives and livelihoods. The remainder of names for the 2007 Hurricane Season is: Felix, Gabriella, Humberto, Ingrid, Jerry, Karen, Lorenzo, Melissa, Noel, Olga, Pablo, Rebekah, Sebastien, Tanya, Van and Wendy. Andrea formed in May as a subtropical storm followed by Barry in June, Chantal in July and Dean, Erin in August. timely action in the event a hurricane was to threaten the island. from storm surge in the event of a hurricane passing the island. a high risk for storm surge and flooding. should also include what they would do with their pets. damage to residential communities two weeks ago. if a system has developed and what threat it could pose to the island. Sebastien, Tanya, Van and Wendy. in July and Dean, Erin in August. hello Aruba, Curacao, and Bonaire. 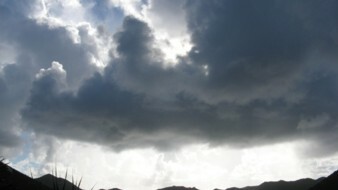 Your friends in St. Maarten are wishing you safe passage of Felix. Hopefully you will only get some rain and high seas and not much more. But prepare in any case, and stay dry! GREAT BAY, St. Maarten (GIS) – Governor Franklyn Richards, says the passing of Hurricane Dean through the Eastern Caribbean island chain Friday and Saturday teaches us that we cannot be complacent and must take the required actions to minimize the risk of injury and destruction. Richards added that it serves as a reminder to the nation that the hurricane season is heading into the peak period and that Hurricane Dean was a wake-up call for everybody to review where they were at when it comes to hurricane preparation. Up to Monday, six persons had perished throughout the Caribbean and millions of dollars have been calculated in damages. Hurricane Dean continues its track through the Caribbean passing to the South of Jamaica on Sunday and the Cayman Islands on Monday. Assessment teams have been very busy visiting the Southern coastal villages and parishes of Jamaica to determine the extent of damage caused by Hurricane Dean as it passed the island’s South coast over the weekend. Governor Richards says he is pleased to learn that forward-teams were already positioned in Jamaica prior to the Hurricane passage which would allow for immediate damage assessments to be carried out once it was safe to do so. These teams are USAID/OFDA, UN/OCHA and PAHO. 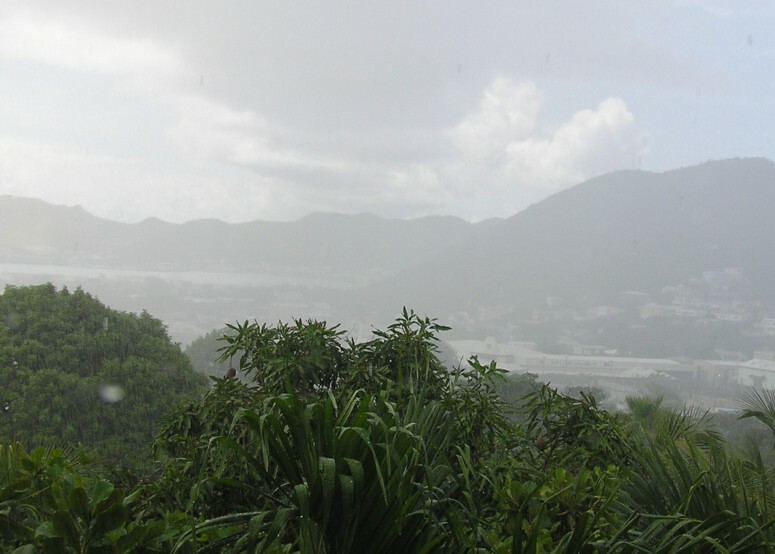 Hurricane Dean did not pose a direct threat to St. Maarten, however the emergency planning department and Meteorological Services monitored the system closely and passed on information and advice to the community in a timely manner. “Preparations are key prior to a hurricane strike. Businesses and government must survive and recover from a disaster as quick as possible which would ensure that our economy can be up and running and our way of life returns to a semblance of normality. “Residents, business owners and contractors have been advised from the beginning of the season to draft plans that would protect their families, business operations and construction sites. When a hurricane threatens our island, what is left for residents, businesses and contractors to do to prepare should be minimal. “If you have a plan, preparations to protect property should be carried out within a short period of time. I was pleased with the state of readiness of the nation and the pro-active approach and preparations taken by various government agencies. “For those who were complacent, let Hurricane Dean be a lesson that we must be prepared. Our response agencies will remain in a state of readiness for the remainder of the hurricane season,” Governor Richards, Chairman of the Emergency Operations Center (EOC) told the Government Information Service (GIS) on Monday. minimize the risk of injury and destruction. as it passed the island?s South coast over the weekend. immediate damage assessments to be carried out once it was safe to do so. These teams are USAID/OFDA, UN/OCHA and PAHO. a "Donate to stormCARIB" sign up on the right above the hurricane correspondents update column..
How long has that been there, Gert? Has anyone else noticed that? Is it just me with poor eyesight? well, of course, I donated right away, and now I urge all of you who either report or read these reports to donate. This is such a valuable site. Right now we all have been glued to this site watching for updates from any of the islands who have experience the wrath of Dean. it is vital that we all do whatever we can to support this site. We now focus our attention and concerns on Jamaica and the Caymans. We wish them good luck and safe passage of Dean. The whole Caribbean is experiencing bad weather from Dean. As Allan from Antigua says, it is a huge storm. Those of us in the Northern islands have been spared the worst. We are thinking of our neighbors in St. Lucia, Dominica, and Martinique though. Hope everyone comes through this OK. It is windy here.... 25-35 MPH winds with higher gusts. and it is cloudy and squally, but not relaly a lot of rain.. The sea and the lagoon are wild. The following is an independent update from a pro met on the storm2k site. He has been doing a great job of keeping us informed and up to date. I hope our friends in the lower islands are safe. Currently in St. Maarten is is very windy. It is cloudy but no rain. Dean moves into the Caribbean. A wind gust to 87 mph was recorded in Fort de France. Conditions will be rapidly improving during the next few hours as Dean moves toward Haiti and Jamaica. Dean is expected to bring winds over 100 mph with gusts in the mountains up to 130-150 mph as it moves by Martinique. 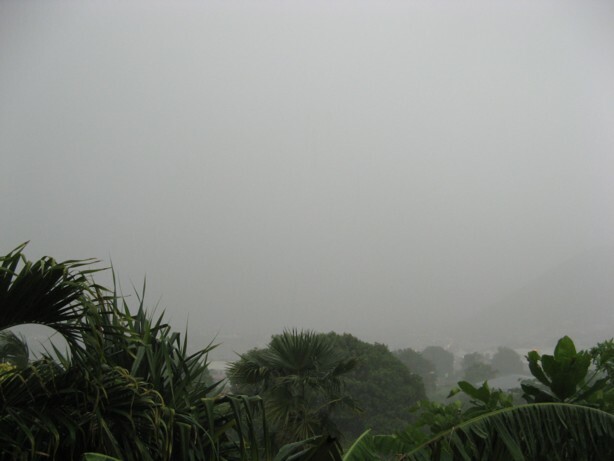 These winds may cause significant damage to Martinique. Hurricane force winds are also expected for St. Lucia and Dominica, while hurricane force wind gusts are expected for Guadeloupe. 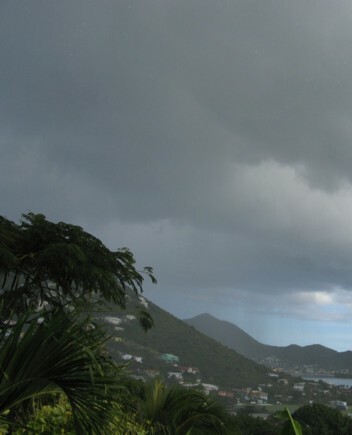 Tropical storm conditions are expected north of Guadeloupe to St. Martin and for Barbados. In addition, up to 10 inches of rain, waves over 20 feet, and isolated tornadoes are expected. NWHHC continues to recommend a Hurricane WARNING for St. Lucia, Martinique, Dominica, and Guadeloupe, a Hurricane Watch/Tropical Storm Warning for Barbados and all islands north of Guadeloupe that are south and east of St. Martin. NWHHC continues to recommend a Hurricane Watch for the entire south coast of the Dominican Republic and Haiti and a Tropical Storm Warning for the U.S. Virgin Islands and Puerto Rico. Any official watches and warnings can be found from the National hurricane Center (RSMC Miami), your national weather service, or local emergency management officials. Residents of Cuba, the Cayman Islands, and the Yucatan Peninsula of Mexico need to closely monitor the progress of Dean. Dean has the potential to impact these areas as a major hurricane this week-en and early next week. Maximum sustained winds remain near 100 mph. The pressure is estimated to be 970mb. Some intensification is expected and Dean could become a major hurricane during the next 24 hours. Hello all. For a live look at what is going on in St. Martin have a look at my website as I have setup a live webcam to record the events of Dean here in Simpson Bay. Direct http://www.nadagato.com/nadagato-live-webcam.html o the web cam! GREAT BAY, St. Maarten (GIS) – The Office of Disaster Management & Preparedness (ODMP) would hereby like to inform the community that St. Maarten remains under a Tropical Storm Warning as of Thursday morning as Hurricane Dean makes its way towards the Eastern Caribbean island chain. A Tropical Storm Warning means that there is a possible threat of tropical storm conditions within the next 24 hours. Due to forecast track uncertainties, the aforementioned warning will remain in place until further notice. Tomorrow Friday, August 17 will be a normal business working and school day. A number of inquiries have come in regarding the aforementioned. Hurricane Dean has been classified as a category 1 hurricane at this time and is expected to pass according to the Netherlands Antilles & Aruba Meteorological Service (NAAMS) at a comfortable distance South of St. Maarten in the course of Friday. According to NAAMS, the forecast track should probably keep tropical storm and hurricane force winds South of St. Maarten, affecting the water and causing rough seas due to high waves and swells to be generated by the hurricane as it enters into the Caribbean Sea. 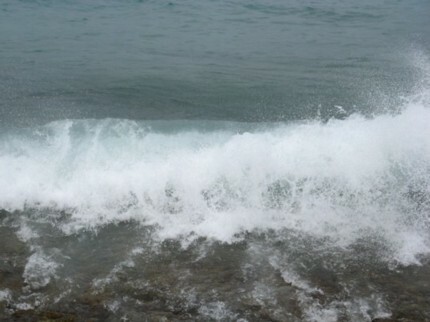 Weather conditions today Thursday, are expected to deteriorate where seas become rough as swells generated by Dean begin to affect local water. On Friday, waves and swells will increase further. 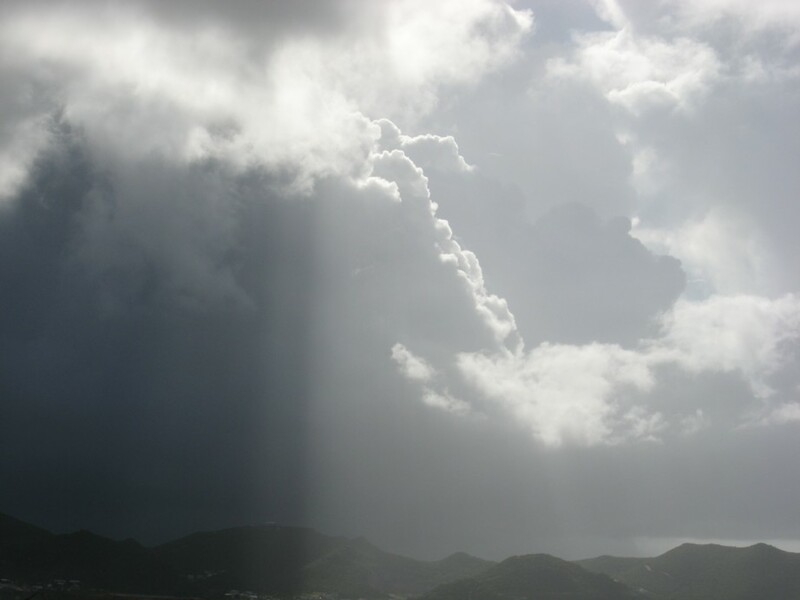 There is also a possibility for squalls and rain bands passing over the island. Residents are strongly advised to continue to monitor radio and TV reports for the latest weather updates with respect to the progress of Hurricane Dean which is forecast to further strengthen and become a category two hurricane before it is forecast to reach the islands of Martinique and Dominica. towards the Eastern Caribbean island chain. number of inquiries have come in regarding the aforementioned. in the course of Friday. enters into the Caribbean Sea. for squalls and rain bands passing over the island. is forecast to reach the islands of Martinique and Dominica. Or read about our storm prep in the <a href=""http://www.nadagato.com/ships-blog/archives.html " target="_blank">ships blog</a>. As Dean continues to strengthen , the Caribbean continues watching and preparing. go to the Talkin' tropics forum and click on the active storm thread. There is a tremendous amount of great information there on Dean, with analyses from pro mets and well informed amateurs. there also is a thread on Dean : for any island in the Caribbean that may be affected. Please post your conditions there as Dean approaches...if you can. Good luck to all those in the way of this storm. Be safe! Even though Hurricane Dean is expected to pass well South of St. Maarten - over 200 miles -, the authorities are still being proactive bearing in mind how fast Dean is traveling and any wobble to the Northwest would change St. Maarten's status of preparations. The Netherlands Antilles & Aruba Meteorological Services this morning upgraded St. Maarten's Tropical Storm Watch to a Warning. - The Public Works Dept will be monitoring the water levels in the Great Salt Pond. The crews and pumps are ready to lower water levels should this be necessary with respect to any large amount of rainfall that we could get from Dean as it passes Martinique and Dominica. The lowering of water in the pond will prevent flooding of residential areas that surround the pond. - Residents living in flood prone areas have been advised to keep guts and water trenches cleared and not to park vehicles close to them or throw debris into the waterways. - Garbage collectors are to empty all bins and collect as much debris as possible from around the island. - Contractors have been asked to clear work sites of all debris and secure construction materials. - The Emergency Alert Radio System was scheduled to be tested at 9.00am. The signal would over-ride regular radio programming. GREAT BAY, St. Maarten (GIS) – The National Hurricane Center (NHC) reported on Tuesday that Tropical Storm (TS) Dean continues to strengthen and that the residents of the Eastern Caribbean islands should continue to monitor the system as the storm moves towards the Eastern Caribbean island chain. TS Dean based on Tuesday weather advisories has taken a more Southerly tracking which would keep it further away from St. Maarten as it makes its way through the Caribbean island chain some time on Friday or Saturday. The Office of Disaster Management & Preparedness (ODMP) encourages residents to continue to monitor the progress of the tropical storm system which has been intensifying. TS Dean will be closely monitored by the ODMP and if required, advisories will be issued in a timely manner to the media regarding what measures should be taken if the system was to change course and possibly pose a threat to the island of St. Maarten. TS Erin has also formed making it the fifth named storm for the season and is located in the Gulf of Mexico off Texas. As we approach the busy part of the hurricane season which runs from August 15 to October 15, residents are advised to make sure that they have already taken certain steps to protect life and property. The first step of storm/hurricane preparedness is ensuring that you are adequately informed. For new residents, start by learning about storms/hurricanes, and how they can affect the island and how to prepare. Learn the location of public shelters. Determine how safe is your area and inquire about flooding of low lying areas. Devise a hurricane preparedness plan. Decide from the onset where you will go if your house isn’t safe. Make sure the house you choose to shelter in is well constructed. Persons living in dwellings, whose structure may not be of the quality of the house constructed out of concrete, should make alternative arrangements in the event of a hurricane threat. If you own a boat, decide where to store it in the event of an emergency. Most importantly, ensure that your home and property insurance are up to date. Do not forget to stock up on any prescription medication your family may need, especially items for the young and elderly. During the hurricane season keep your vehicle’s gas tank more than half full at all times. system as the storm moves towards the Eastern Caribbean island chain. the Caribbean island chain some time on Friday or Saturday. located in the Gulf of Mexico off Texas. certain steps to protect life and property. ?What You Need to Know.? storms/hurricanes, and how they can affect the island and how to prepare. sure the house you choose to shelter in is well constructed. event of a hurricane threat. importantly, ensure that your home and property insurance are up to date. install them. Practice installing them. Stock up on plywood if necessary. Get it measured, cut and labeled for each opening if you do not have shutters. each trip to the supermarket. your vehicle?s gas tank more than half full at all times. Everyone here is on alert to see what will happen with Dean. So far I do not see anyone running around madly making preparations. Today, I think is a "wait and see" day. It does seem like Dean will cut through way South of us. Martinique does not look to be in a good position vis a vis Dean right now. So when I start to breathe a sigh of relief that St. Maarten is out of the woods, I can start to worry and fret about my Southern neighbors. Let's hope wherever Dean passes that he is not too strong and does not cause anyone too many problems. GREAT BAY, St. Maarten (GIS) – The Office of Disaster Management & Preparedness (ODMP) is calling on the nation to closely monitor the progress of the fourth tropical storm system for the 2007 hurricane season which was named by the National Hurricane Center on Tuesday morning as Tropical Storm (TS) Dean. During the coming days, TS Dean will be closely monitored by the ODMP and if required, advisories will be issued in a timely manner to the media regarding what measures should be taken if the system poses a threat (direct) to the island of St. Maarten. Computer models have been forecasting that TS Dean could pass very close to St. Maarten, however it is too early to determine if this will be the case as long term forecast is prone to a wide margin of error. These long term forecast are revised daily and the ODMP will keep the public informed as the storm makes its way towards the Eastern Caribbean island chain. All residents are hereby advised to closely monitor weather reports on a daily basis in order to keep abreast of the progress of the seasons fourth named tropical weather system. On Monday the ODMP and alerted the 10 Emergency Support Functions (ESFs) units to the existence at that time of Tropical Depression #4 – which has now become TS Dean – and to closely monitor the system in the coming days as it nears the Caribbean island chain. National Hurricane Center on Tuesday morning as Tropical Storm (TS) Dean. Computer models have been forecasting that TS Dean could pass very close to St.
way towards the Eastern Caribbean island chain. GREAT BAY, St. Maarten (GIS) – Managing Director of the Simpson Bay Lagoon Authority Corporation, Russell Voges advises all boat owners and captains to keep track of the weather bulletins and to make sure they take the necessary precautions to safeguard their boats, dinghies and properties should Tropical Storm Dean pose a threat to St. Maarten. The storm path can be followed on the website of the U.S. National Hurricane Center is <nhc.noaa.gov>. Please be advised that the Simpson Bay bridge will stop operating when the ten minute average wind speed as measured by the Meteorological Service of the Netherlands Antilles exceeds 35 kmh or 19.7 mph and therefore will be closed for maritime traffic. The daily bridge openings are 09:30; 11:30 and 17:30 hours. 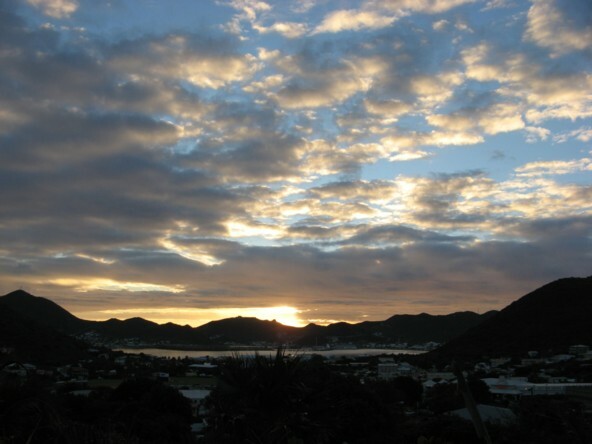 The Simpson Bay Lagoon Authority advises all boaters very strongly and urgently to bring in their boats long before any storm is nearing the shores of St. Maarten so they can make use of the regular bridge openings and assure themselves of anchoring down their boats in a safe and secure manner. Any barges brought in through the bridge channel should have a second tugboat tailing the barge to ensure that the barge will not be hitting the bridge structure from side to side. Especially barges should be brought in early when the winds are not high and the tides are not strong. The Simpson Bay Lagoon Authority advises all companies once more that they will be held responsible and liable for all visible and all hidden damages incurred during passage and cautions them to take the utmost care. Barges that are not accompanied by a tailing tugboat will not be permitted to transit. The Simpson Bay Lagoon will be patrolled extra prior to the threat of a storm by the Coast Guard the Maritime Police and the Lagoon Authority and all anchored boats will be inspected to see if they are properly and safely anchored and do not form any hazard during the storm to any of the other boats anchored in the lagoon. All boaters in St. Maarten and in the surrounding islands of Anguilla and St. Barths are hereby explicitly warned that if they would like to seek refuge in the Simpson Bay Lagoon with their boats to weather out the storm should Tropical Storm Dean pose a threat to these islands, they should be constantly on the alert," Managing Director of the Simpson Bay Lagoon Authority Corporation, Russell Voges told the Government Information Service (GIS) on Tuesday. 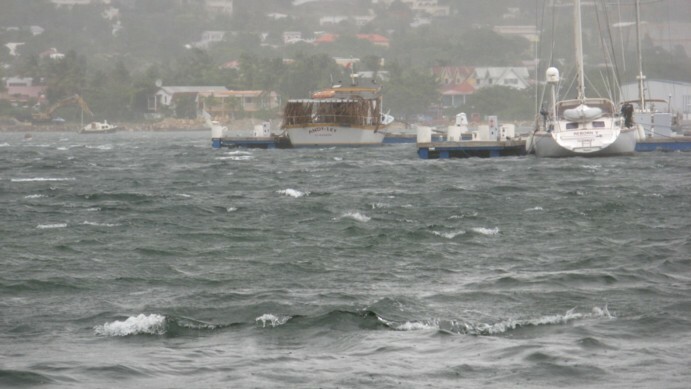 The expected wind speeds for Friday, August 18 will probably oblige the Simpson Bay Lagoon Authority not to operate the bridge and therefore there will be no passage into the Lagoon. Do not hesitate! Make up your mind now! Make use of the regular bridge openings during Wednesday and Thursday to bring in your boat. Only if the measured wind speeds allow such, the bridge will be operated on Friday. If the increase in flow of maritime traffic seeking refuge requires such, the Lagoon Authority will consider special openings. For more information the Lagoon Authority can be reached on tel: 545 3183 and the bridge attendants can be reached on VHF channel 12.
website of the U.S. National Hurricane Center is <nhc.noaa.gov>. themselves of anchoring down their boats in a safe and secure manner. tailing tugboat will not be permitted to transit. All boaters in St. Maarten and in the surrounding islands of Anguilla and St.
such, the Lagoon Authority will consider special openings. the bridge attendants can be reached on VHF channel 12. ABOUT 1390 MILES...2235 KM...EAST OF THE LESSER ANTILLES. TOWARD...WEST NEAR 21 MPH. MAXIMUM SUSTAINED WINDS...40 MPH. As Dave says, the models are all over the place on TD 4, a soon to be named storm. So all we can do is wait and watch and prepare.. The latest discussion from NHC shows it being very close to St. Maarten and Anguilla in 120 hours. GENERAL MOTION IS LIKELY TO CONTINUE DURING THE NEXT DAY OR TWO. So let's see what happens today. These models are changing every minute. GREAT BAY, St. Maarten (GIS) – The island’s mainstay, the tourism sector, is being advised to review hurricane preparation plans now as we approach the most active period of the 2007 hurricane season which begins August 15 and runs through October 15. Residents and businesses are also advised to pay keen attention to weather reports with special focus on the Eastern Atlantic Ocean where tropical weather systems that form off the African Coast (Cape Verde Islands) can become a serious threat to the Eastern Caribbean island chain. At this stage of the hurricane season, tourism-oriented businesses should be prepared. The prevention of the loss of life of our visitors and staff along with protecting property from damage is the responsibility of every business owner. The engine of the economy is every single business operation on the island. 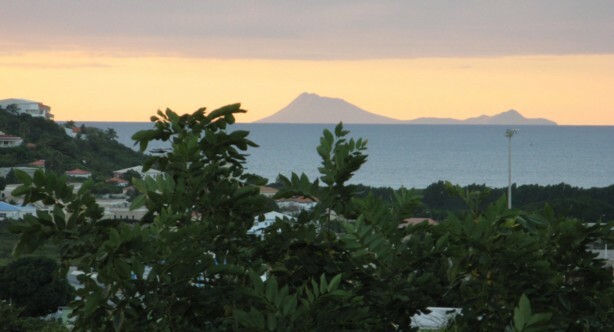 Each one plays a very important role in the island’s tourism-oriented economy. As the Office of Disaster Management & Preparedness theme says, “How have you prepared yourself for the hurricane season? Now is the time for residents to review what preparations are in place and to get ready, and not when a storm is about to hit. The remainder of names for the 2007 Hurricane Season is: Dean, Erin, Felix, Gabriella, Humberto, Ingrid, Jerry, Karen, Lorenzo, Melissa, Noel, Olga, Pablo, Rebekah, Sebastien, Tanya, Van and Wendy. Andrea formed in May as a subtropical storm followed by Barry in June and Chantal in July. serious threat to the Eastern Caribbean island chain. subtropical storm followed by Barry in June and Chantal in July. Models for 90L have shifted south. That looks like good news for the Northern islands..maybe not such good news for the lower islands. Everyone needs to be watching this one carefully. It is, of course, too early to see where this is going, but it definitely has the potential to turn into a storm. We have to watch this one, folks! I read Dave's blog and while we have nothing happening yet, it surely is time to be prepared , as he says. We certainly are approaching the height of the season. 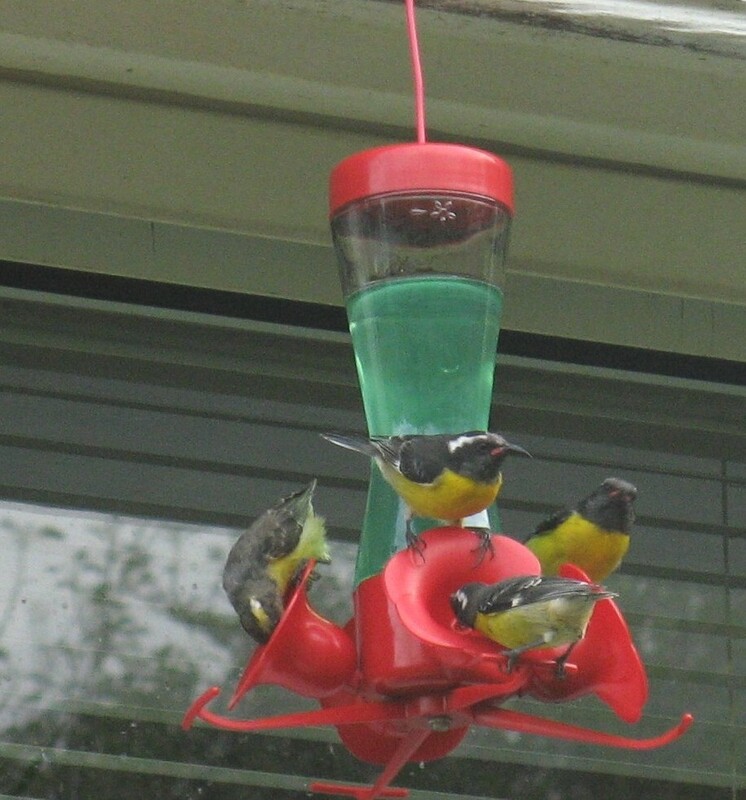 In the meantime the sugar birds are monopolizing my humming bird feeder and the poor hummingbirds can't get close. Well, I am back on the island after traveling for 3 weeks. I must say it's good to be back. We landed in San Juan yesterday afternoon and my husband said it looks like it is raining. Nah, I said, it's just Saharan dust. and when we landed in St. Maarten, it was the same haze.. Saharan dust again. I guess that is good since it is supposed to keep storms away. Our garden looks lush and green so I guess we have had some rain while I was away. So now vacation is over and I can start my daily ritual of checking the African coast. The models have this wave moving towards the NE Caribbean so we all need to keep watch. and it looks like it can develop into something. Did I ask for more rain last night? well, my prayers are being answered.. It has been raining on and off all morning. It clears up for 10 minutes and then another squall come rolling in. Of course, my wash is on the line and will never dry but I better not complain. Keep those squalls coming! Fill my cistern! Yes! 2 CM so far . Not enough yet. More! More! Lots of "weather" surrounding us.. Thunder and lightening.. a little rain..very little. On this first day of hurricane season, I wish all of us in the Caribbean well and hope all storms stay away from our islands. In the meantime, I am praying for rain. The weather here continues to be oppressive. We have gray cloudy skies, absolutely no wind, and occasional drizzle. We need a real good downpour like Culebra had. Have a good weekend, Caribbean neighbors. GREAT BAY, St. Maarten (GIS) – The Office of Disaster Management & Preparedness (ODMP) on Thursday afternoon released a listing of 11 temporary hurricane shelters for the 2007 hurricane season. Two to three additional shelters will be added shortly. OH, how I wish it would rain. I hear thunder in the distance. Skies are cloudy, but no rain. It is incredibly still. There is no wind and the air is heavy and it is hard to breathe. The dogs are hardly moving and are panting as if they ran a marathon. I am locking myself in the air conditioned bedroom right now. GREAT BAY, St. Maarten (GIS) – Governor Franklyn Richards Chairman of the Island’s Disaster Emergency Management Organization, the Emergency Operations Center (EOC), is calling on the St. Maarten community to prepare for what has been forecast to become an active 2007 hurricane season. Governor Richards appeal comes on the eve of the 2007 hurricane season which officially opens on June 1. The U.S. NOAA Climate Prediction Center latest forecast calls for 13 to 17 named storms, with seven to 10 becoming hurricanes, of which three to five could become major hurricanes of Category 3 strength or higher. An average hurricane season brings 11 named storms, with six becoming hurricanes, including two major hurricanes. “An appeal has been made by weather forecasters to those living in hurricane prone regions to begin their preparation plans. I would strongly urge those who haven’t done so already to make preparations. “For the past two weeks I have been informing the St. Maarten community about hurricane preparations and I do hope that they have taken the advice serious and have made preparations. “Time and time again we have had the experience and have been taught to be prepared and don’t wait until the last minute to gather our stuff together because then it would have already been too late. Prepare early in order for you and your family to be able to ride out the storm in a safe manner,” Governor Richards told the Government Information Service (GIS) on Thursday. The names for the 2007 Hurricane Season are: Barry, Chantal, Dean, Erin, Felix, Gabriella, Humberto, Ingrid, Jerry, Karen, Lorenzo, Melissa, Noel, Olga, Pablo, Rebekah, Sebastien, Tanya, Van and Wendy. Andrea formed in May as a subtropical storm. been forecast to become an active 2007 hurricane season. officially opens on June 1.
who haven?t done so already to make preparations. you and your family to be able to ride out the storm in a safe manner,? Governor Richards told the Government Information Service (GIS) on Thursday. GREAT BAY, St. Maarten (GIS) – Disaster Coordinator Winston Salomon met with representatives of the Emergency Support Functions (ESFs) which is the Island Government’s Disaster Management Organization that forms the Emergency Operations Center (EOC). The different representatives present were, the Department of Public Works, Sector Health Care Affairs (SHCA), GEBE, Police, Sector Social Welfare, Telem and the Island Secretariat. Each representative gave the Chairman of the meeting Disaster Coordinator Salomon, an update on preparations for the season. Public Works reported that they have been busy cleaning various trenches in the community districts and that this would be an ongoing effort. The Fresh Water Pond will be dredged to increase its carrying capacity of rainwater in the case of heavy rainfall. The floodwater pumping stations are being checked to make sure that everything is in place and in good working order for the season. Public Works have also been assisting the Community Councils with district clean-ups and tearing down of old shacks. SHCA has been in the process of updating their hurricane manual, otherwise they have been making sure that everything is in place for the upcoming season. Gebe reported that the high tension electrical lines are nearly all underground and that the project is almost completed. Placing the low tension lines underground is a process that will take much longer. Gebe has also been busy trimming tree limbs near lamp poles and they have also established a cooperation relationship with the power electrical companies of Aruba, Bonaire, and Curacao as well as with Carilec in the event of a hurricane strike. The Police reported that they are ready for the season and they already have a standard protocol in place in the eventuality of a hurricane strike. Sector Social Welfare reported that 11 hurricane shelters have been confirmed so far for the season with another three pending approval. Whatever repairs that needs to be made to any one of the shelters will be carried out by the Department of Public Works. The listing of shelters will be announced shortly. Telem reported that in June they will complete preparations for the season while the Island Secretariat reported that they are ready to guarantee the continuation of the functioning of the civil service corps in the event of a hurricane strike. The ESFs were informed that the Royal Dutch Marines and Royal Navy are prepared to render whatever assistance is needed before, during and after a hurricane strike. They have also recently updated their hurricane operations manual. Two interns from the Netherlands also gave the EOC grouping a presentation about a draft disaster plan for St. Maarten Ports Authority (SMPA) including maritime incidents. The 2007 hurricane season officially starts on June 1 through November 30. GREAT BAY, St. Maarten (GIS) – Governor Franklyn Richards, Chairman of the Island’s Disaster Emergency Management Organization, is appealing to members of the community to draft a Family Disaster Plan and create a Disaster Supply Kit in preparation for the 2007 hurricane season less than a week away. Last week experts from the U.S. NOAA Climate Prediction Center announced that this season will be an above normal one – active - and recommends those in hurricane-prone regions to begin their preparation plans. The Family Plan should be based on your vulnerability to Hurricane Hazards that could affect your family such as storm surge or flooding. By knowing your vulnerability and what actions you should take, you can reduce the effects of a hurricane disaster. Securing your home should also be a top priority. There are things that you can do to make your home more secure and able to withstand stronger storms. Preventing the loss of life and minimizing the damage to property from hurricanes are responsibilities that are shared by all, Governor Richards told the Government Information Service (GIS) over the weekend. Locate a safe room or the safest areas in your home for each hurricane hazard; Determine escape routes from your home as certain areas could be inundated by flooding and storm surge in low lying areas; Make a plan now for what to do with your pets if you need to evacuate; Post emergency telephone numbers by your phones and make sure your children know how and when to call; Check your insurance coverage; Stock non-perishable emergency supplies and a Disaster Supply Kit. Water, at least one gallon daily per person for three to seven days; Food, at least enough for three to seven days, non-perishable packaged or canned/juices, foods for infants or the elderly, snack foods, non-electric opener, cooking tools/fuel, paper plates/plastic utensils; Blankets/Pillows; Clothing (rain coat, sturdy shoes); First Aid Kit/Medicines/Prescription Drugs; Special items for babies and the elderly; Toiletries/Hygiene items/Moisture wipes; Flashlight and batteries; Battery operated radio; Fully charged cell phone with an extra battery; Cash/Credit Cards; Toys/Books/Games; Important documents should be put in a waterproof container; Tools; Vehicle fuel tanks should be filled a few days before a hurricane strike; Pet care items (medication, amply supply of food and water, a carrier or cage, a muzzle and leash). The most important precaution you can take to reduce damage to your home and property is to protect the areas where wind can enter. It is important to strengthen the exterior of your house so wind and debris do not tear large openings in it. You can do this by protecting and reinforcing these five critical areas: roof, straps, shutters, doors and garage doors. Be sure to ask other family members, friends and neighbors if they are hurricane aware, be prepared and ready. The 2007 Hurricane Season name list is: Barry, Chantal, Dean, Erin, Felix, Gabriella, Humberto, Ingrid, Jerry, Karen, Lorenzo, Melissa, Noel, Olga, Pablo, Rebekah, Sebastien, Tanya, Van and Wendy. GREAT BAY, St. Maarten (GIS) – Governor Franklyn Richards, Chairman of the Island’s Disaster Emergency Management Organization, the Emergency Operations Center (EOC), is calling on the St. Maarten community to start preparing for the 2007 hurricane season. Even though the official start of the season is still two weeks away, Governor Richards is urging residents to use this period to prepare themselves. “We have already had a wake-up call with the formation of the first named storm of the season last week Wednesday called (Subtropical Storm) Andrea. “The month of May for the Caribbean and the U.S. Eastern Seaboard and the Gulf of Mexico, is a period used to prepare for the six-month hurricane season. It makes no sense to make major preparations days or hours before a hurricane strike. “Prepare early and avoid being caught unprepared. Preparedness starts with every one of us within civil society. As a community we must plan early and don’t wait until the last moment to rush to get things done because it can result in injury,” Governor Richards told the Government Information Service (GIS) on Tuesday. Some of the preparations that should be done now is the removal of debris from around homes and businesses; checking hurricane shutters and the roof of your home or business to make sure that windows can close securely and their are no weak spots in the roof. Putting together a hurricane disaster kit is also another essential part of preparing early as well as stockpiling non-perishables. In the Caribbean, the women typically are mothers to large numbers of children. They are proud strong loving women. They raise their children,their step children, their grandchildren and sometimes their great grandchildren. 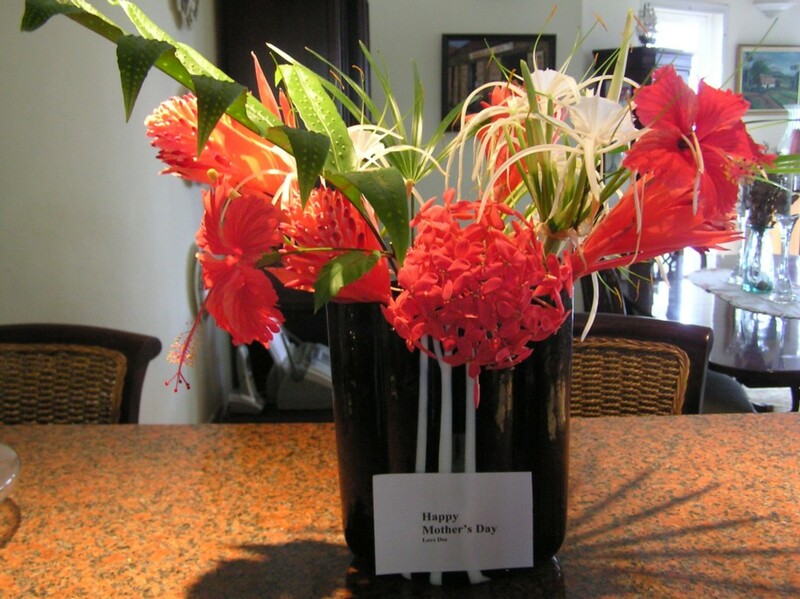 Today is a day when they and all mothers are honored. I think they should be honored every day.....It is a 24/7 lifetime job. Today is the day when the florists make a lot of money as everyone sends flowers. I have my own "florist" in the family and he made me this beautiful bouquet with flowers from the garden.